Some people meander through life and let years pass by. Not so with Donna Auguste. Donna takes the hand she’s dealt, makes a plan and moves forward. And that’s exactly how the computer scientist and engineer handled life once she learned she had lupus. Finding out she had lupus, however, proved to be the most painful part of her journey. “That was the hardest part,” she said, “and when I was finally diagnosed I was happy. At least I could make a plan. ”Donna’s life is full, she spends a few afternoons each week playing with her grandson while his parents work. She needs her energy to keep up with him. Her life also includes her church and her foundation, Leave a Little Room. And if she weren’t busy enough, Donna is an important member of the music program at Cure d’ Ars Catholic Church, a Denver church known for its gospel music. She is co-director of the children’s choir and oversees a recording studio where church singers and musicians record their music for people and parishes throughout the world. The Leave a Little Room Foundation is another passion of Donna’s. She used her computer science and engineering experience improve lives. “The foundation was created to facilitate the sharing of gifts with which we have all been uniquely blessed. When we share our talents and gifts with individuals and communities around the world, amazing things happen,” she said. Since Donna launched the foundation in early 2000, the Foundation has worked side-by-side with communities, organizations and churches to provide school books for under-funded schools in the United States, to build houses for families in Mexico, to help bring electricity, clean water and medical supplies to rural communities in East Africa, and to help build a wing onto a hospital in Haiti. So when lupus symptoms crept into Donna’s hands, wrists, feet, ankles and knees in 2008, this driven woman had no time for being sick. Like many others, she first thought she had the flu. But her body grew more sore and she couldn’t shake the fatigue. 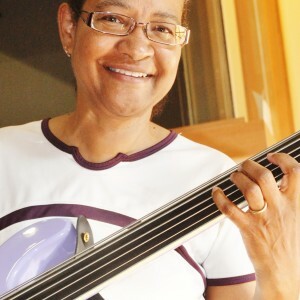 Donna struggled to play the bass guitar for her church and perform typical household tasks. She knew the ailment was something more complicated. Then she did as many of us do – she started self diagnosing via the internet, growing more alarmed at all of the possibilities and feeling increasingly helpless as her health seemed to deteriorate. Finally Donna got to a point where she was so frustrated about the lack of an answer that she made plans to be seen at the Mayo Clinic in Minnesota to find an answer. “Within ten days I had a diagnosis of lupus. I had data that supported it and I had resources available to me so I could develop a plan,” Donna said. And why couldn’t doctors in Colorado figure out the problem? Apparently she showed symptoms before markers for lupus showed up in her bloodwork. When she went to the Mayo clinic she’d been having symptoms for eight months. Blood tests indicated, “ a mild case of lupus,” at that point. Donna said the experience at the Mayo clinic was impressive. The hospital had a schedule planned for her for the week that included testing, support opportunities, doctor meetings and advisory visits. “The sense of service there was amazing,” she said. For many, traveling to the Mayo Clinic seems like an unrealistically expensive proposition. Donna thought so too, but found that her health insurance would pay for 100 percent of her medical needs at the clinic. She paid for her travel and lodging. In her experience, she said, it’s not uncommon for many insurances to pay for such treatment. And though she tested positive for the disease, she was relieved to finally have an answer as to why she hadn’t been well. She was also grateful to have resources at her fingertips to generate a plan. She met with nutritionists, a personal trainer and mapped out the necessary lifestyle changes.